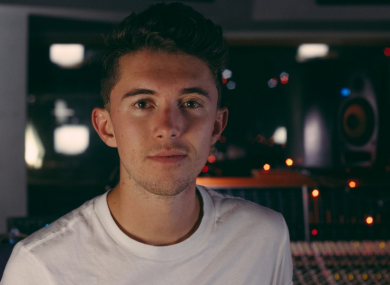 RYAN O’SHAUGHNESSY WILL represent Ireland at this year’s Eurovision Song Contest, to be held in Portugal this summer. He will perform the ballad ‘Together’ in the Eurovision semi-final in Lisbon on Tuesday 8 May – though the song itself hasn’t been released yet. The 25-year-old man from Skerries, Dublin, who plays the guitar, piano and the saxophone, penned the song along with Mark Caplice and Laura Elizabeth Hughes. He appeared on the finals of both The Voice of Ireland and Britain’s Got Talent in the same year, as well as spending a brief spell as ‘Mark Halpin’ on Fair City. Ryan’s most well-known song No Name has amassed over 45 million hits on YouTube, and in the last three years he’s has toured the USA and Canada. Ryan said he was “delighted” the song had been chosen and that he was asked to represent Ireland. I plan on doing Ireland proud by bringing a song and performance to Eurovision that we haven’t seen since the days of Rock and Roll Kids. “Last year’s winning song from Salvador Sobral was a beautiful, melodic piece, and I think it may have carved the way for the Eurovision to revert back to being a song contest where true songs can flourish. Ryan will perform in the first semi final in the Altice Arena which has a capacity of 20,000 and is one of the largest indoor arenas in Europe. The Eurovision final takes place on Saturday 12 May. Email “This man will represent Ireland at this year's Eurovision”. Feedback on “This man will represent Ireland at this year's Eurovision”.